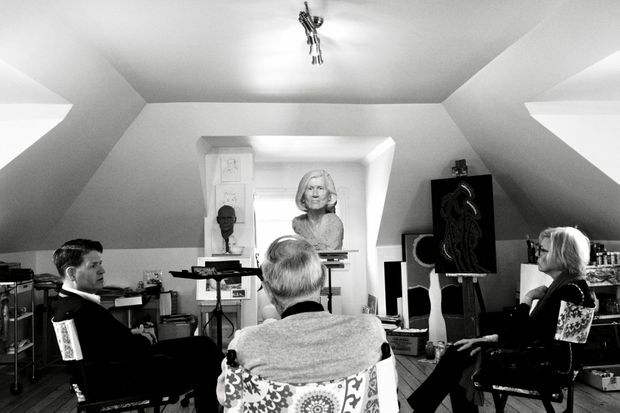 Former chief justice of Canada Beverley McLachlin sits in front of her portrait sculpture in Christian Corbet's studio in Sackville, N.B. For Beverley McLachlin, life after the Supreme Court has been far from a bust. In fact, a portrait sculpture of the former chief justice of Canada is finally nearing completion. The commission by artist Christian Corbet (and undersculpted in part by his current protégé, Adam Milley) commenced in 2016 and has included three life-sittings. The final one took place last May at the artist’s Broadmoor Manor studio in Sackville, N.B. Corbet’s work is collected by more than 100 art galleries. He’s been formally given the personal title of Regimental Sculptor, after he was commissioned to create a bust of Prince Philip in 2013. He prefers to focus on “women of accomplishment” and has done portraits of the Queen Mother, Jane Goodall and Margaret Atwood. Soon, he can add Canada’s first female and longest-serving chief justice to the list. The life-size bust, pictured here in a near-finished state, is awaiting final instructions: Supreme Court staff are deliberating on what material in which to cast it. It’ll be a decision that lasts forever.